UNC women’s soccer coach Anson Dorrance, on the occasion of signing a five-year contract extension just before this year’s College Cup, was asked by his former player, former U.S. national team member, and current ESPN commentator, Julie Foudy, how much he left in him. The 67-year-old, 23-time national champion’s response? Tuesday night in Smith Center, no one died on the court, and UNC men’s basketball didn’t get the chance to do that to the Blue Devils. But in a pinch, the N.C. State Wolfpack sure make a fine substitute for the hall of famer’s wishes. It was a game that was never really close, as so many of Roy Williams 30 victories over N.C. State at UNC have been. At the half, despite the Wolfpack shooting 50 percent from the field, UNC led 56-40. Three Tar Heels were already in double digits scoring. UNC was out rebounding State 23-11. The game had been tied at one point, 10-10 after one of Braxton Beverly’s four first-half threes, but otherwise, the Tar Heels had led wire to wire. That dominance never left the building, even if the crowd grew restless early in the second half because the outcome of the game was already decided. 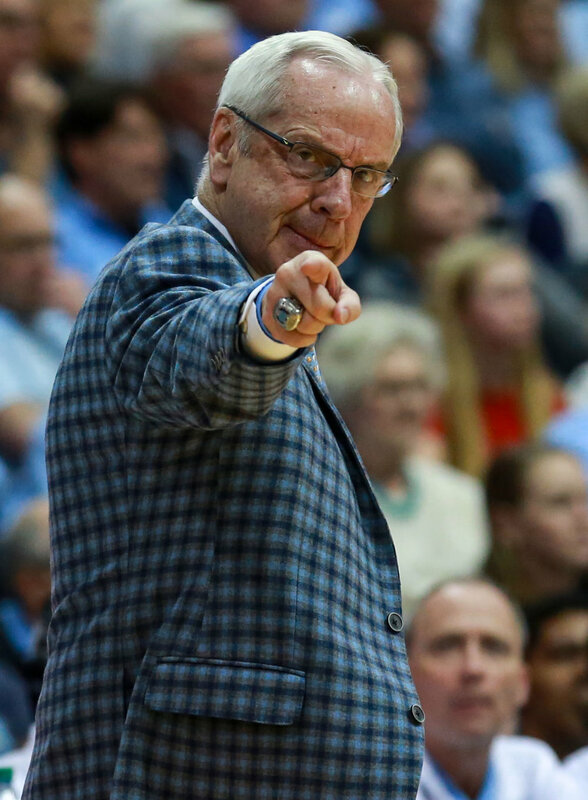 A 13-8 run out of halftime for UNC, followed by a 7-2 out of the first media timeout, powered by five different Tar Heel scorers during that stretch, forced Kevin Keatts to take a timeout down 77-50. Outside of a 14-4 run near the end of the game, with State’s starters playing UNC’s walk-ons, the Wolfpack never looked relevant the rest of the way. For sure, nearly everyone played to their potential on the offensive end of the court in the blowout. Coby White continued his ACC breakout by taking it to the rack for 21 points. The senior duo of Williams and Cameron Johnson added 17 points a piece and five combined three-pointers. Garrison Brooks flirted with a triple-double with eight points, ten rebounds, and a career-high six assists. Nassir Little came off the bench and got to the charity stripe 10 times, knocking down eight of those en route to 12 points and six boards. But none made the impact of the kid from Huntersville, who always seems to play his best against that team from Raleigh. 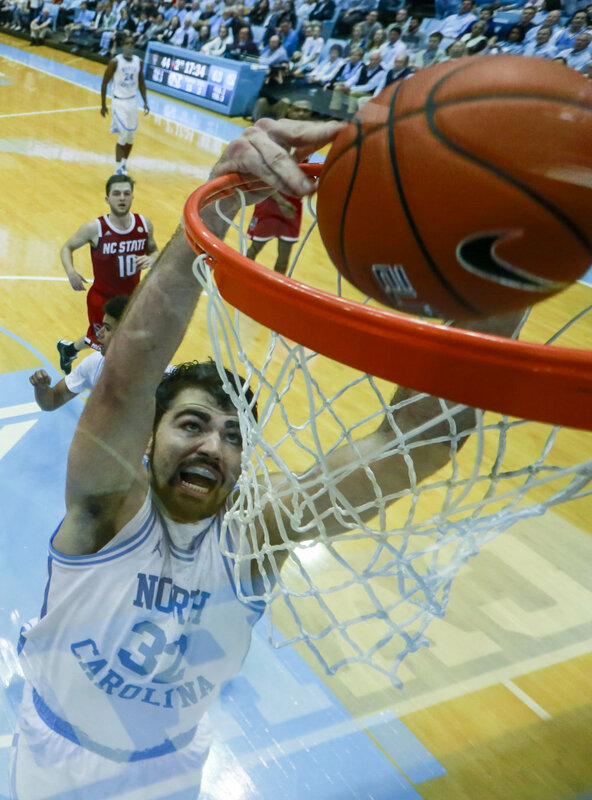 Noted Wolfpack killer Luke Maye ended his career against State, pending any postseason matchups, with perhaps his best game yet, 31 points on 10-15 shooting with 12 rebounds, finishing multiple and-1 buckets at the hoop and bullying his way to easy baskets in the post. The senior forward has four straight double-doubles against the Wolfpack, has scored over 30 points three of the last four games against State, and has averaged 29.0 points and 13.0 rebounds over his final two years in Chapel Hill against his triangle foe. The man himself was, a usual, a bit more humble in motivations when explaining his success against N.C. State. So yes, it was just a team that scored only 24 points on Saturday, needing to steady the ship as the gauntlet of ACC play continued on. A team Roy William is 30-4 (!!!) against as UNC’s head coach. And yes, the crowd grew restless, even if the players weren’t, as the game’s result was all but decided with UNC in the double bonus with 10:15 to go in the game, and Kenny Williams swishing a three to score UNC’s 101st point of the night, securing discounted sausage biscuits for all across the Tar Heel state with 5:37 to go. And hey, it might not of been Duke. But beating an in-state rival like that on your own court? Anson Dorrance might say that’s to die for.